Download and save the XML manifest file to a network file share. Then follow these instructions for how to add to Excel. 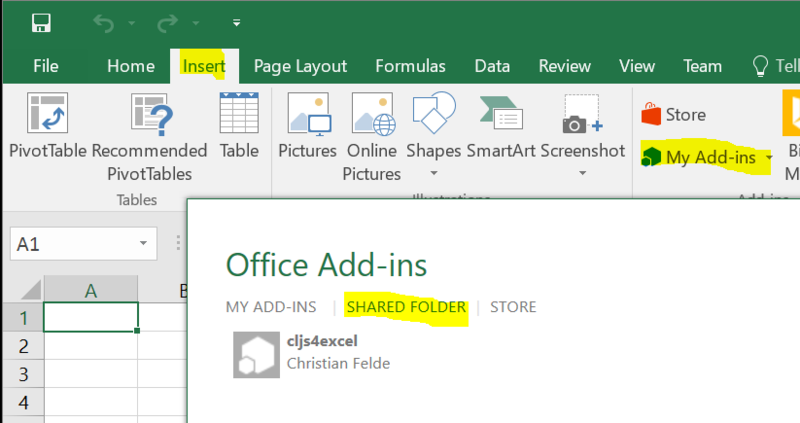 After the mandatory Excel restart, go to Insert -> My Add-ins as shown below. Should work with Microsoft Excel 2013 and newer. Note that the manifest XML must always be placed on some network share for Excel to accept it. However, this network share can simply be a shared folder locally, as long as you stick to UNC paths (for example: \\WIN-AABBCCDDEE\Share\cljs4excel.xml). No need for any advanced external file server. Used to get the current document selection. Replace current document selection with given matrix data. Add a named binding to a document region. The name can either refer to an existing named item in the document, or a region by using the A1 reference style. Examples of A1 references: A1 (single cell at A1), B1:C2 (2x2 at B1 to C2), Sheet1!$A$1:$B$2 (2x2 within Sheet1 on $A$1 to $B$2), etc..
Add a document binding by prompting user to provide a region. Add a document binding for the current selection. Call the given function with a vector of all current binding ids. Pass current binding data to given function. Replace binding selection with given matrix data. Multiple pairs of id and matrix may be given. Replace binding selection with given sequence data. The sequence data is reshaped according to the binding area, and any missing cells will be replaced with empty content. Multiple pairs of id and sequence data my be given. Subscribe to data changes on binding id, passing it to given function whenever it is changed. Remove an existing binding. Any data within the binding remains in sheet. Unsubscribe to data changes on binding id. Eval the content on specified reference. The reference is either a named item or A1 style reference. If no reference is given the current selection is used. Example use cases can be found on github.com/cfelde/cljs4excel/blob/master/examples/EXAMPLES.md. All the code can be found on github.com/cfelde/cljs4excel. Feedback, bug fixes, feature requests, and pull requests are all welcome.